Snow Leopard (v. 10.6.x) – Nginx on Mac OS X Snow Leopard in 2 Minutes. Lion (v. 10.7.x) – Nginx on Mac OS X Lion in 2 Minutes. Mountain Lion (v. 10.8.x) – Nginx on Mac OS X Mountain Lion in 2 Minutes. Mavericks (v. 10.9.x) – Nginx on Mac OS X Mavericks in 2 Minutes. Yosemite (v. 10.10.x) – Nginx on Mac OS X Yosemite in 2 Minutes. Note the System Version line. As you can see, I have 10.11 which is El Capitan. You may use newer versions of Nginx and the prerequisite software, but whether you choose to do that, or you stick to the packages outlined in the above article, you will get a working Nginx web server on your Mac. Please note that the included build script should still work on earlier versions of Mac OS X if you don’t want to go the DIY (do it yourself) route. 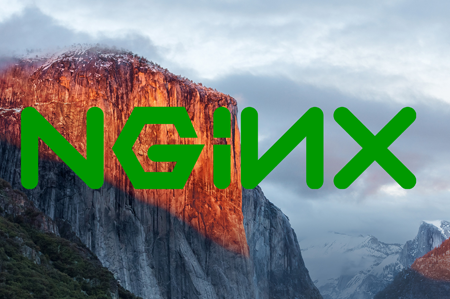 This guide will show you how I compiled a basic version of Nginx 1.9.6 on Mac OS X 10.11 El Capitan. The “2 minute” compilation that I mention in the title of this article is when using the script that I provide below. For the DIY folks, I’m breaking down the steps. Variations in your Mac’s specs, and your copy and paste skills may increase the total time to over 2 minutes. First, if you do not already have it installed, download and install Xcode from the Mac App Store. Make sure to have Xcode installed. This will prompt you to install Command Line Developer Tools. Go through the installer and then continue below. PATH="/usr/bin:/bin:/usr/sbin:/sbin:/usr/local:/usr/local/sbin:/usr/local/bin:/usr/X11/bin:/opt/X11/bin" – I emphasized in bold type what you need to add to your PATH. It’s a pretty quick process to get Nginx installed nicely on your Mac, especially if you use the shell script. This provides a very basic install, but it should get you moving in the right direction. Your feedback is appreciated, so leave a comment below.